The call for artists for Momentum Tulsa is now available at www.MomentumOklahoma.org. Momentum Tulsa will be held at Living Arts, 307 E. Brady Ave. Living Arts is an ideal partner for this event, with a beautiful gallery space and a very artist-friendly attitude. We encourage artists to consider the space when submitting to Momentum Tulsa, particularly those of you working in installation, performance, dance, film/video, or new media. 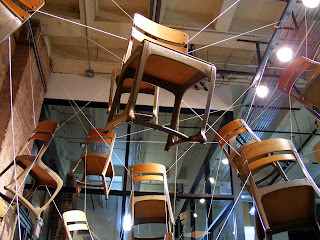 Living Arts includes some spaces that are a little more unusual but could be a perfect place to showcase your work. See below for details about the spaces available within Living Arts. 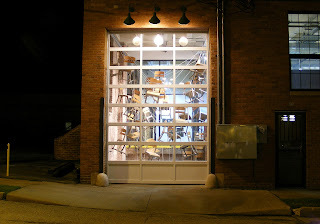 You can also visit the space during their regular gallery hours: Tues, Wed, Fri, Sat 1-5 pm and Thurs 1-9 pm. 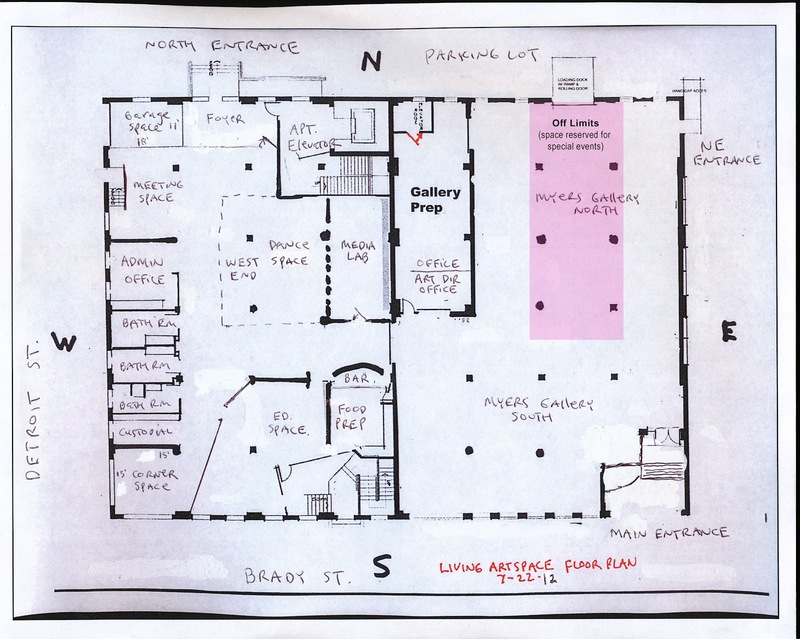 Here is a simple floor plan of the gallery. This gallery map shows an overall layout of the space. 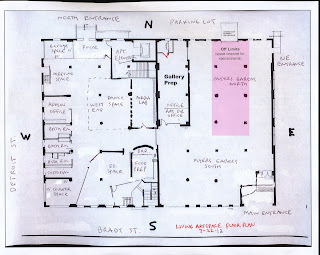 The pink area shows space that cannot be used for art that will remain throughout the gallery hours, due to special events happening in that space. Living Arts Gallery Layout. Click to view larger. 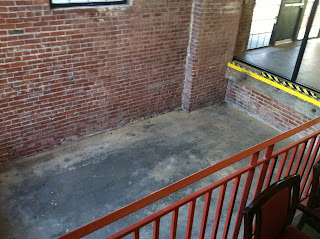 In the west side of the building is a sprung wood dance floor, appropriate for dance or other performance works. In the upper left corner of the site map, you see the “garage space”. 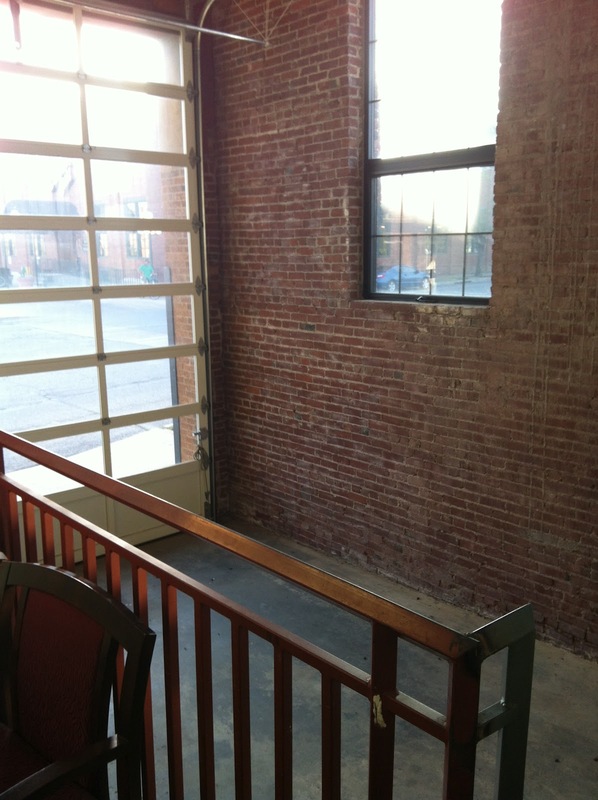 This is a sunken loading dock area with a garage door opening to Detroit Street. 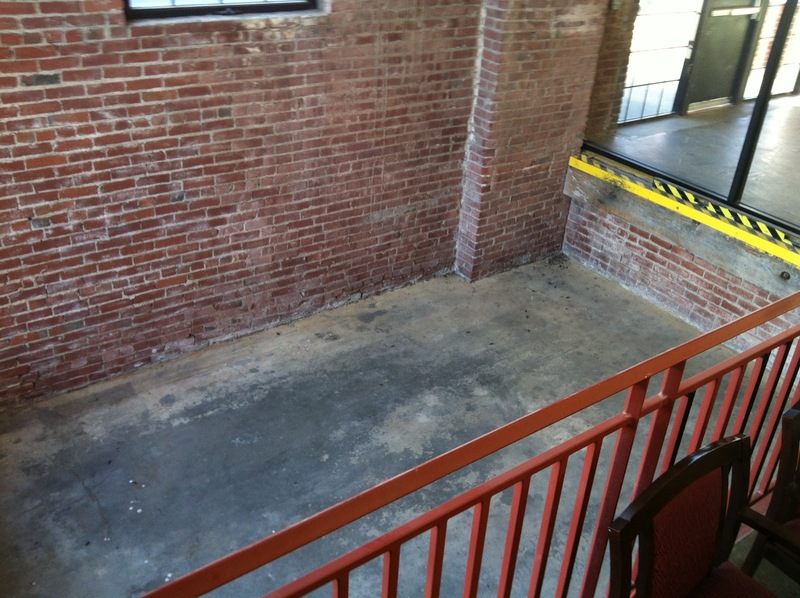 This space is 13′ w X 16′ d X 18′ h. These images show the space empty, as well as in use with performance and installation. In the bottom left corner of the site map, you see the “corner space”. This space has windows on 2 sides, at the corner of Brady and Detroit Streets. 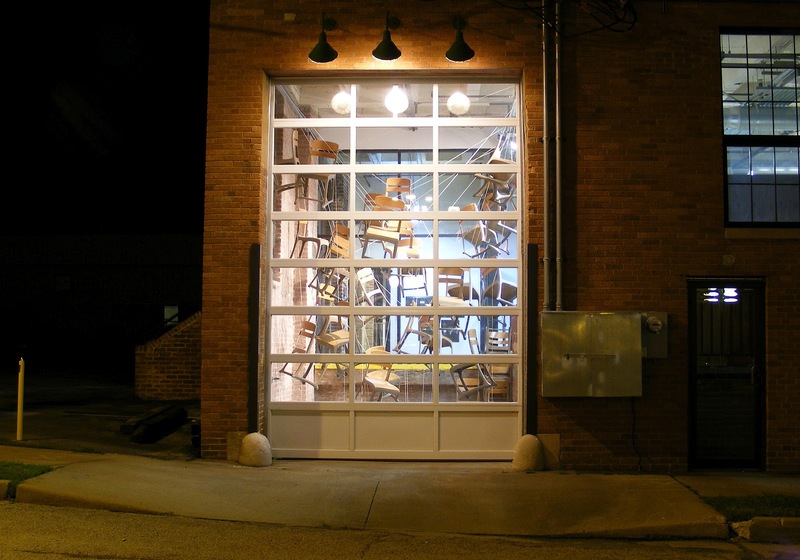 This space works well for installations, performances or video that can be seen well at night.The corner space is 15′ w X 15′ d X 14′ h.
Heidi Tindle, performance/installation at Momentum Tulsa 2009. 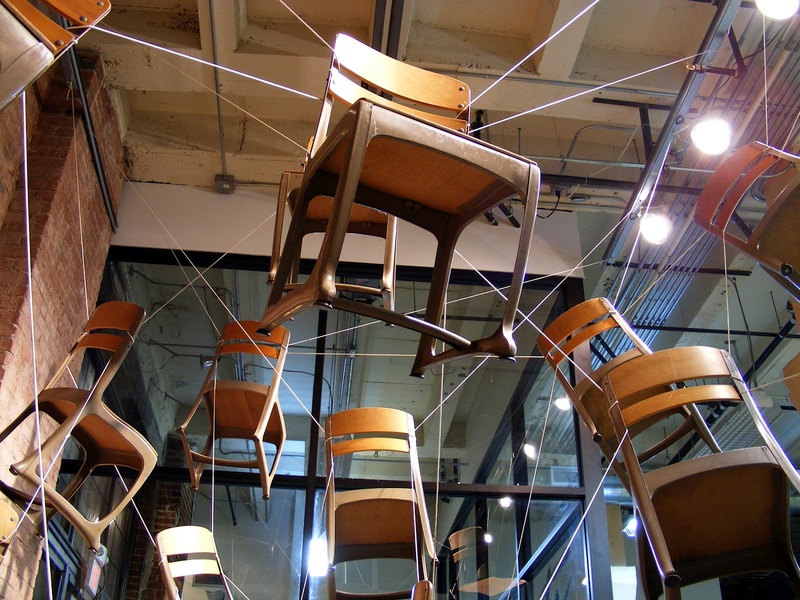 Submissions for Momentum Tulsa are due by September 1, 2014 at 5 pm. Oklahoma artists aged 30 and younger are eligible. Free to the public for the first time ever, Momentum Tulsa opens October 3, 6-10pm, in conjunction with the First Friday Art Crawl at Living Arts Tulsa. Sponsorships are now available for Momentum Tulsa.